The Washington Redskins have ruled out cornerback Josh Norman for their Week 7 tilt against division rival Philadelphia Eagles. This is the second-straight game missed by Norman who returned to practice in a limited capacity this week, his first action since leaving Week 3 with a rib injury. In the three games Norman has appeared in, he has been good but hasn’t played at the level he has shown in past seasons. His overall grade of 79.7 ranks 39th among cornerbacks. However, he has been effective at limiting production from opposing receivers allowing a catch rate of just 40.0 and a passer rating against of just 60.1. 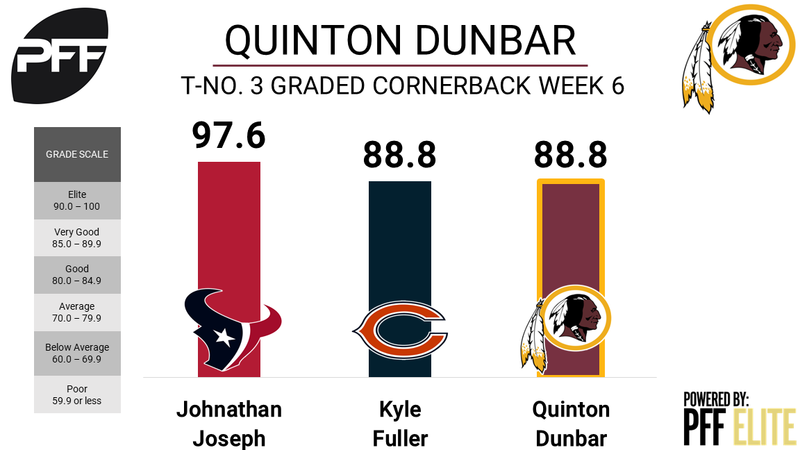 Quinton Dunbar will likely see his second straight start in place of Norman. Last week he filled in admirably earning a game grade of 88.8 allowing just five receptions for 67 yards despite being targeted a game-high 10 times. He also registered two pass deflections and racked up four total stops.